Regular and non-invasive assessments of cardiovascular function are important in surveillance for cardiovascular catastrophes and treatment therapies of chronic diseases. Resting heart rate, one of the simplest cardiovascular parameters, has been identified as an independent risk factor (comparable with smoking, dyslipidemia or hypertension) for cardiovascular disease. Currently, the gold standard techniques for measurement of the cardiac pulse such as the electrocardiogram (ECG) require patients to wear adhesive gel patches or chest straps that can cause skin irritation and discomfort. Commercial pulse oximetry sensors that attach to the fingertips or earlobes are also inconvenient for patients and the spring-loaded clips can cause pain if worn over a long period. The ability to monitor a patient's physiological signals by a remote, non-contact means is a tantalizing prospect that would enhance the delivery of primary healthcare. For example, the idea of performing physiological measurements on the face was first postulated by Pavlidis and associates and later demonstrated through analysis of facial thermal videos. Although non-contact methods may not be able to provide details concerning cardiac electrical conduction that ECG offers, these methods can now enable long-term monitoring of other physiological signals such as heart rate or respiratory rate by acquiring them continuously in an unobtrusive and comfortable manner. Beyond that, such a technology would also minimize the amount of cabling and clutter associated with neonatal ICU monitoring, long-term epilepsy monitoring, burn or trauma patient monitoring, sleep studies, and other cases where a continuous measure of heart rate is important. The use of photoplethysmography (PPG), a low cost and non-invasive means of sensing the cardiovascular pulse wave (also called the blood volume pulse) through variations in transmitted or reflected light, for non-contact physiological measurements has been investigated recently. This electro-optic technique can provide valuable information about the cardiovascular system such as heart rate, arterial blood oxygen saturation, blood pressure, cardiac output and autonomic function. Typically, PPG has always been implemented using dedicated light sources (e.g. red and/or infrared wavelengths), but recent work has shown that pulse measurements can be acquired using digital camcorders/cameras with normal ambient light as the illumination source. However, all these previous efforts lacked rigorous physiological and mathematical models amenable to computation; they relied instead on manual segmentation and heuristic interpretation of raw images with minimal validation of performance characteristics. Furthermore, PPG is known to be susceptive to motion-induced signal corruption and overcoming motion artifacts presents one of the most challenging problems. In most cases, the noise falls within the same frequency band as the physiological signal of interest, thus rendering linear filtering with fixed cut-off frequencies ineffective. In order to develop a clinically useful technology, there is a need for ancillary functionality such as motion artifact reduction through efficient and robust image analysis. We used a basic webcam embedded in a laptop (built-in iSight camera on a Macbook Pro by Apple Inc.) to record the videos for analysis. All videos were recorded in color (24-bit RGB with 3 channels × 8 bits/channel) at 15 frames per second (fps) with pixel resolution of 640 × 480 and saved in AVI format on the laptop. 12 participants (10 males, 2 females) between the ages of 18-31 years were enrolled for this study that was approved by the Massachusetts Institute of Technology Committee On the Use of Humans as Experimental Subjects (COUHES). Our sample featured participants of both genders, different ages and with varying skin colors (Asians, Africans and Caucasians). Informed consent was obtained from all the participants prior to the start of each study session. For all experiments, an FDA-approved and commercially available blood volume pulse (BVP) sensor (Flexcomp Infiniti by Thought Technologies Ltd.) was used to measure the participant's BVP signal via a finger probe at 256 Hz for validation. The experiments were conducted indoors and with a varying amount of sunlight as the only source of illumination. Figure 1 show the experimental setup. 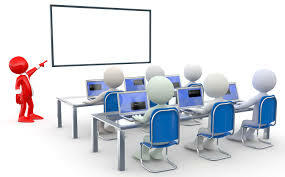 Participants were seated at a table in front of a laptop at a distance of approximately 0.5 m from the built-in webcam. Two videos, each lasting one-minute, were recorded for all participants. During the first video recording, participants were asked to sit still and stare at the webcam. Post processing and analysis of both the video and physiological recordings were done using custom software written in MATLAB (The MathWorks, Inc.). An overview of the general steps in our approach to recovering the blood volume pulse is illustrated in Fig. 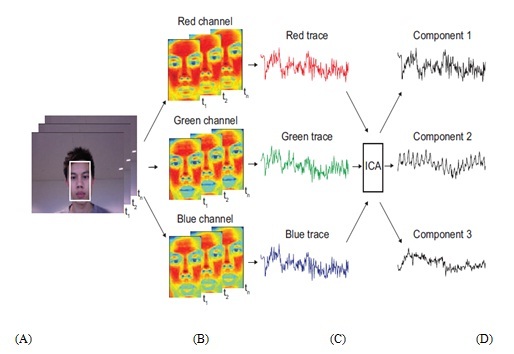 2.3 First, an automated face tracker was used to detect faces within the video frames and localize the measurement region of interest (ROI) for each video frame [Fig. 2.3(a)]. We utilized a free MATLAB-compatible version of the Open Computer Vision (OpenCV) library to obtain the coordinates of the face location. The OpenCV face detection algorithm is based on work by Viola and Jones, as well as Lienhart and Maydt. A cascade of boosted classifier uses 14 Haar-like digital image features trained with positive and negative examples. The pre-trained frontal face classifier available with OpenCV 2.0 was used. The cascade nature uses a set of simple classifiers that are applied to each area of interest sequentially. At each stage, a classifier is built using a weighted vote, known as boosting. Either all stages are passed, meaning the region is likely to contain a face, or the area is rejected. The dimensions of the area of interest are changed sequentially in order to identify positive matches of different sizes. For each face detected, the algorithm returns the x- and y-coordinates along with the height and width that define a box around the face. From this output, we selected the center 60% width and full height of the box as the ROI for our subsequent calculations. To prevent face segmentation errors from affecting the performance of our algorithm, the face coordinates from the previous frame were used if no faces were detected. If multiple faces were detected when only one was expected, then our algorithm selected the face coordinates that were the closest to the coordinates from the previous frame. • Low cost compares to other equipments. • This project illustrates an innovative approach to pervasive health monitoring based on state-of-the-art technology. • The Medical Mirror fits seamlessly into the ambient home environment, blending the data collection process into the course of daily routines. • It is intended to provide a convenient way for people to track their daily health when they use the mirror for shaving, brushing teeth, etc. POH, M.-Z., MCDUFF, D.J. AND PICARD, R.W. 2010. Non-contact, Automated Cardiac Pulse Measurements Using Video Imaging and Blind Source Separation. Optics Express, vol. 18, no. 10, 10762-10774. S. Cook, M. Togni, M. C. Schaub, P. Wenaweser, and O. M. Hess, "High heart rate: a cardiovascular risk factor?" Eur. Heart J. 27 (20), 2387-2393 (2006). I. Pavlidis, J. Dowdall, N. Sun, C. Puri, J. Fei, and M. Garbey, "Interacting with human physiology," Comput. Vis. Image Underst. 108 (1-2), 150-170 (2007). M. Garbey, N. Sun, A. Merla, and I. Pavlidis, "Contact-free measurement of cardiac pulse based on the analysis of thermal imagery," IEEE Trans. Biomed. Eng. 54 (8), 1418-1426 (2007).